Reading the "Nothings that Are": Craig Dworkin's "No Medium"
“In No Medium Craig Dworkin looks at works that are blank, erased, clear, or silent … point[ing] to a new understanding of media.” So goes the back cover copy of the author’s new book, which was released in March by MIT Press. 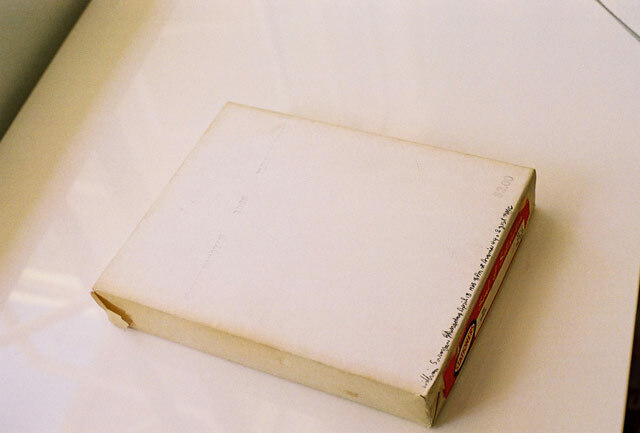 This paratextual statement, while certainly catchy, is a bit misleading regarding Dworkin’s argument as well as the actual nature of his objects of study (some of the treated works, such as John Cage’s 4 ‘33″ and Robert Rauschenberg’s White Paintings, are well known while many others are not); and it risks obscuring, to some extent, the host of wonderful subtleties, the wily interpretive moves and maneuvers that can be found within the book itself. Nevertheless, in “The Logic of Substrate,” the first and strongest chapter of the book, Dworkin provides a definition that affords us a more elegant and refined, if not novel, understanding of how media operate: “Those objects that are casually referred to as ‘media,’ … are perhaps better considered as nodes of articulation along a signifying chain: the points at which one type of analysis must stop and another can begin; the thresholds between languages; the limns of perception.” In this sense, the title No Medium acts as a kind of homophonic and edifying mnemonic: to realize that there is no medium — or better yet, to put the term “medium” sous rature, that is, under erasure — is to know media in a richer and, to use Dworkin’s own phrase, “more robust” way. We can usefully put Dworkin’s definition into motion by applying it to a key example which he discusses in a later chapter: Nam June Paik’s “Zen for Film” (1962–64), an unexposed strip of film which, when played by a projector, seems to simply display a white image on screen. This discussion of “Zen for Film” should amply demonstrate that works of art can only approach silence or blankness asymptotically. 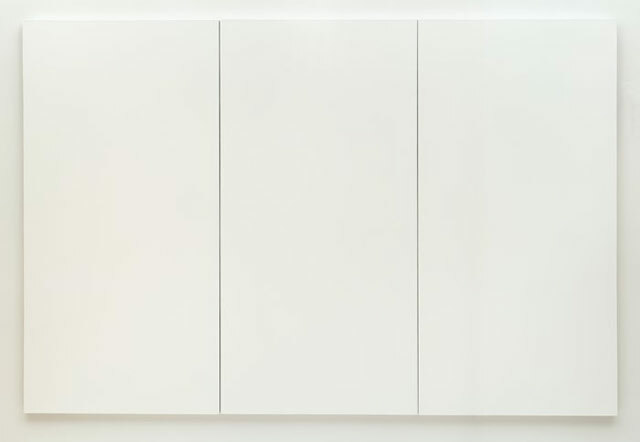 In other words, there is no such thing as a purely silent or blank work due to, in the case of Rauschenberg’s White Paintings, the sheer haecceity of the material artifact (Cage called the White Paintings “airports for the lights, shadows and particles”) or, in the case of Cage’s 4 ‘33″, the inherent noisiness of the performed work’s environment. In a curious review for the Times Higher Education, David Revill, perhaps overly conditioned by the back cover copy’s insistence on the “blank, erased, clear, or silent,” characterizes Dworkin’s objects of study as “works in diverse art forms in which the focus or raw material is, literally, nothing.” The qualifier “literally” reveals the extent to which Revill is egregiously mistaken. 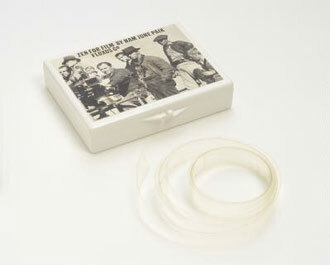 The focus of “Zen for Film” is not, pace Revill, nothing; it is more like what Nick Kaye calls “the threshold of the medium,” the “exchanges between the film and its environment,” which includes all the dust and scratches that Dworkin aptly describes. Furthermore, there are many works discussed in No Medium that are only partially blank, empty, or erased, staging a confrontation between something and nothing, inscription and unwritten emptiness. Chapter 3, entitled “Textual Prostheses,” for example, treats works that present paratexts without texts: Jennifer Martenson’s long poem “Xq281,” Jenny Boully’s essay “The Body,” and Paul Fournel’s novel Suburbia, among others. What is surprising, in the context of this book, is how much there is to see and read in these works. 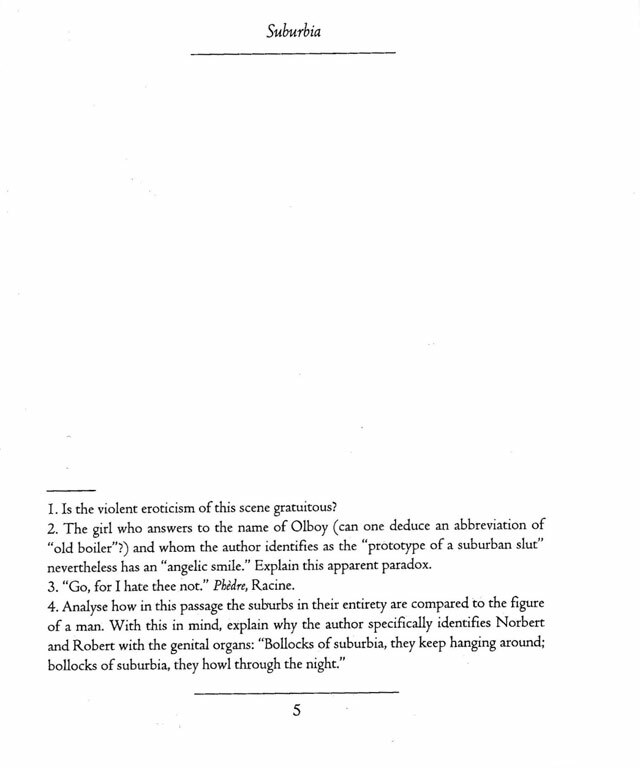 Page 5 of Fournel’s Suburbia, a “novel” which consists of an elaborate framing structure (including a table of contents, a foreword, footnotes, and afterword) without the body, is, from a certain perspective, far less “blank” than any given page of, say, George Oppen’s Discrete Series, which, as it is collected in the New Directions edition of New Collected Poems, gives each short poem of the series a full page to itself. According to Dworkin, “most” of these works “tend toward a rather sloppy, indulgent eclecticism.” Yet the presence of this chapter within No Medium constitutes an eclectic inclusion in itself. Writers such as Martenson, Boully, and Fournel seem to be set up as straw (wo)men, and their works are perhaps more interesting in the context of genre rather than media. Dworkin, then, may be at his best when interpreting works in which there is as little expressive content as possible. This allows him, like a good detective, to make sense of the most inconspicuous detail and to present creative synchronic and diachronic contextualizations; it also allows him to make productive and surprising connections across disparate disciplines. Tom Friedman’s “1,000 Hours of Staring” (1992–97), for example, a 32 1/2 x 32 1/2″ blank sheet of paper is “trimmed to the pattern … of an easel” and is “only marginally larger than Kazimir Malevich’s Белое на белом (White on White, 1918).” Dworkin argues that Friedman’s work “hangs … between poetry and the visual arts, between writing and drawing” in that it “seems to aspire to the monochrome canvas of modernist abstraction” while “only point[ing] … back to the paper page.” Likewise, Rauschenberg’s White Paintings “translate the concept of the cinematic screen to the medium of paint.” Aram Saroyan’s 1968 Kulchur Press “book” — a wrapped ream of “long-grain business-bond letter-size” paper bearing only a price, a copyright notice, and the factory label — invokes “the specter of typing” thereby “underscor[ing] its affront to the expressive output of previous modernist generations.” Yet as “a monochrome four-pound block” and “a readymade consumer object,” Saroyan’s work is also in dialogue with Carl Andre’s minimalist “Bricks” and Andy Warhol’s Brillo Boxes. And “ream,” as Dworkin notes, is “a tidy paragram of ‘Aram,’” giving the book a “paronomastic countersignature.” Dworkin, himself, is a prolific and pyrotechnic practitioner of paronomasia and his puns and etymological incursions peppered throughout No Medium are clever and a pleasure to read. No Medium is not only an admirable feat of painstaking research that puts into conversation an impressive range of artworks, both famous and obscure, but also a testament to the fact that for the industrious critic encountering an apparent absence there is always something interesting to say. 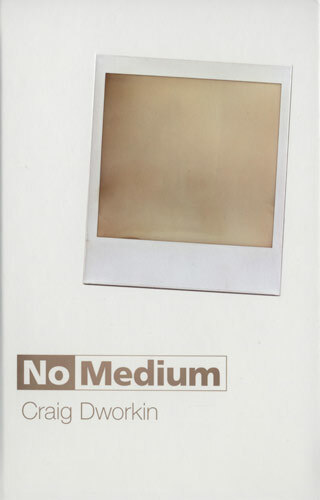 Craig Dworkin’s No Medium (2013) is available from The MIT Press.